Argyll truly has its own special beauty. From peaceful wooded glens to beautiful beaches; gorgeous little fishing ports to romantic castles, Argyll and the Inner Hebrides have all the ingredients of a classic Scottish holiday. FootprintFocus provides invaluable information on transport, accommodation, eating and entertainment to ensure that your trip includes the best of this beautiful region of Scotland. 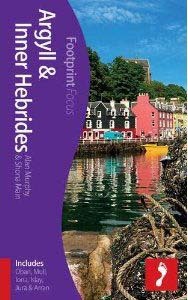 * Essentials section with useful advice on getting to and around Argyll and the Inner Hebrides * Comprehensive, up-to-date listings of where to eat, sleep and seek adventure * Includes information on tour operators and activities, from sampling the finest whiskey to sea fishing. * Detailed maps for Argyll and the Inner Hebrides. * Slim enough to fit in your pocket. With detailed information on all the main sights, plus many lesser-known attractions, FootprintFocus Argyll & Inner Hebrides (includes Oban, Mull, Iona, Islay, Jura & Arran) provides concise and comprehensive coverage.